The Donald practicing his swing. Donald Trump is an easy target; he’s cartoonishly awful, with his weird hair and “you’re fired” catch-phrases. 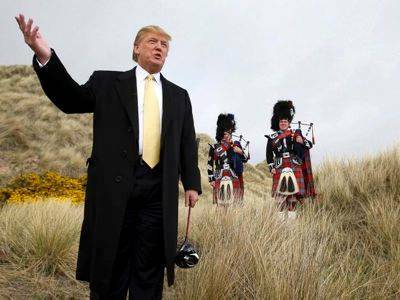 But even if you already know how horrid The Donald is, watching Anthony Baxter’s documentary You’ve Been Trumped will probably make you hate Trump even more. And that is quite a film-making feat. 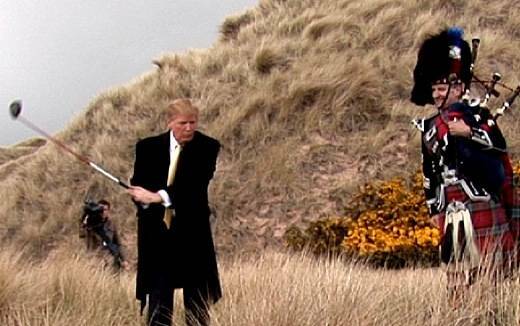 Baxter’s film delves into the controversy surrounding Trump’s plans to build an over-the-top luxury golf course in rural Scotland, thereby effectively destroying the unique ecosystem of one of the last of the UK’s wild sand dune areas. And while this environmental devastation is enough make you loathe Trump and his profit-above-all ethos, it is how he treats the local residents that is truly appalling and also the main focus of the film. Baxter’s lens is focused on the human side of the story, and that elevates it beyond simple documentation. 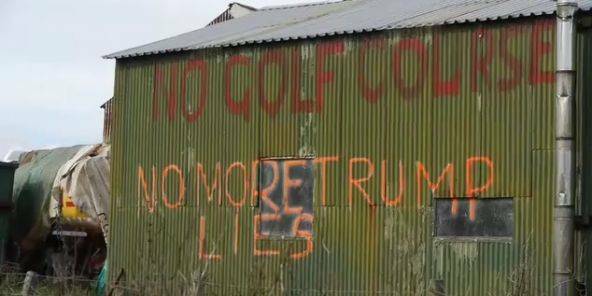 This film gives voice to the people who occupy the land where Trump plans to build his golf course. These people are not really able to stand up against Trump’s wealth and power in any significant sense (especially when the police and the Scottish government seem to be in Trump’s pocket), but at least Baxter’s film is able to tell their side of the story effectively and with compassion. This film explores a time-worn “David and Goliath” theme, but it is also one that is also timely, given the hardships many ordinary people (the “99%”) have experienced in the last few years as a result of the economic downturn. Indeed, many people can identify with the anger and helplessness felt by local farmer Michael Forbes, a man who Trump has repeatedly harassed through the media, calling Forbes’ working farm a “slum” and saying that Forbes “lives like a pig.” Trump, who knows he has already won the fight to build his golf course, seems to relish kicking someone when they are already down. Trump comes across as schoolyard bully, which of course is exactly what he is. Still, somehow Forbes and the other local residents maintain their dignity throughout, which is an inspiring message to every “little guy” who has been bullied by someone more powerful. This film does not have a happy ending, and the details of the controversy are still unfolding. But if you are concerned with the ever-increasing power that those with great wealth have in our modern world, then You’ve Been Trumped is worth seeing and supporting. This entry was posted in reviews and tagged documentaries, Donald Trump, VIFF. Bookmark the permalink.